I wrote this post with a big relieve in my heart, knowing that I could finally make a macaron, and not just any macaron, but macaron Pierre Herme style! I've always been shy away from this particular French goodie. When half of the world seems to be very enthusiastic and has been making what appears to be the most popular little snack in France, me on the other hand, are trying to make excuses not to follow the macaron trend. I first knew about macarons about 2 years ago when I was reading lots of french blogs and all of them have at least posted one macaron post, all colorful and lined up like soldiers in a box. My eyes immediately drawn into these little things and I started to find out more about this jewel. I found so many tutorials on making macarons, temperature, humidity, consistency, aged egg whites, etc, and I thought, what could be so hard making a meringue cookie with only egg whites, sugar, and almond powder? It surely seemed simple enough for me at that time, but oh boy was I wrong. I tried one recipe from one french blog that I followed at that time. Her recipe seemed to be quite popular as many of other blogs followed her recipe, and she's using Italian Meringue method. My first attempt in this cookie was not love at first sight. It surely did not look anything like the picture in her blog, it has no "feet", it cracks, and most importantly, it was REALLY sweet, nothing close to what I was expecting, a wonderful taste that everyone praised for. I dumped all of them in the trash. This is how I started my journey and curiosity for macarons. 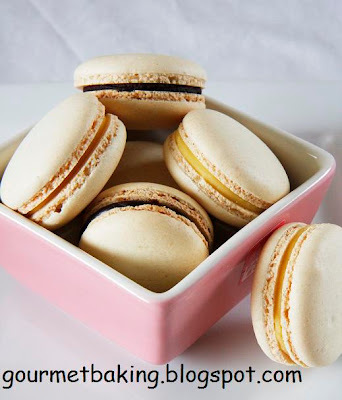 I read and read lots more blogs about macarons, and how I know that there are two methods, french meringue (FM) method, and italian meringue (IM) method . I tried a couple different recipes too from trusty blogs, from a japanese cookbook that I own and they're all using the FM method, which is easier. But none of them gave me a satisfactory result. They had feet, but they're not perfect, it didn't give me a straight frilly feet, but I think this because I folded the batter a little too much. The tops were not smooth, but this is because I was too lazy to sift them. I thought it's nearly impossible to sift ground almonds through my flour sifter because they will never go through. On my last attempt, I did pulse my almond powder even more with food processor and sifted it and the tops were smooth. Another problem is that they're too fragile, they have thin shells that cracks easily and still the worst problem, they're still REALLY sweet even after I reduced the sugar. I think I tried making macarons about 6 times and never really got a perfect macaron (that's why you never see them on my dessert table menu :D). Granted that I didn't really know how it supposed to taste like, I didn't know what a perfect macaron is, until I tasted one from Laduree (thanks to my sister in law who graciously shared her macarons with me). It was still sweet but not sickeningly sweet that it would hurt my teeth. They taste none like the ones I got from some French patisserie here, which were very sweet. So, I was determined once again to relive my excitement towards macarons. When Valentine rolled around, I saw more and more macarons post and my hands were itchy to get into these little precious. Then I saw Veron's post on Pierre Herme's macarons, and bingo! 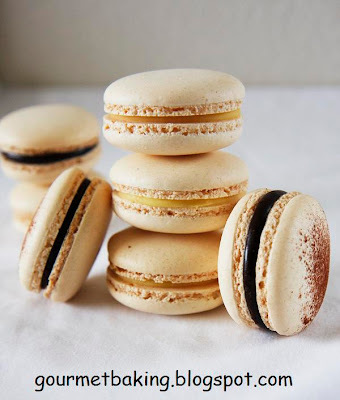 She kindly posted PH original macaron recipe and I was so excited because it's very hard to find original professional pastry chef recipe in the web, especially when that pastry chef is Pierre Herme. I set aside special time for me to make this (which was on President's Day holiday) and not trying to multitask and making different things all at once (although, I did manage to make some pate sucree while waiting for the macarons to dry out :D). I sifted the almond powder 2-3 times and I followed the recipe to the T! I did have a feeling that it will still be super sweet by looking at the amount of sugar but I followed it anyway. I carefully placed the baking pan in the oven and trying not to stuck my nose in the window while it's baking., although I did that anyway on the 7th minutes and I almost jumped out of excitement when I saw that they're all have beautiful feet, the ones I've been looking for, and smooth tops! I tried to redeem my joy while cleaning up although I probably smile the whole time while doing this :D.
I didn't color the batter at all because I didn't know how they're gonna turn out. Now that I know they turned out wonderful, I can use all the color in the rainbow for my macarons. The most important thing is that they don't taste as sweet as the previous 6 batches I made in the past, although I think PH recipe has more sugar total, I'm wondering if this has anything to do with the IM method, hmm.... They're still sweet for my Asian taste, but not painfully sweet, and I think the sweetness it similar if not the same as the ones from Laduree. Sift the almond powder and confectioners' sugar together. Set aside. Combine the granulated sugar and the water in a saucepan and cook until it reaches 245F. Don't stir the syrup as you will end up with crystallized mass. Meanwhile, while the sugar is cooking, start whipping the aged egg white on medium speed until it forms a soft peak. When the sugar is ready, pour the cooked syrup in a steady stream over the meringue with the mixer running on slow. It will splatter, but don't try to scrape them into the meringue as you would get lumps. Increase the speed to high and continue beating until you have a stiff glossy meringue. Mix the fresh egg white with the almond-sugar mixture and blend together. Fold in the meringue into this almond mixture in addition. Add about a third of the meringue and fold progressively, then proceed with another third of the meringue and fold it in. Don't overfold the batter as you would have a gloppy mess. Consistency is really important at this point, some people say that it should flow like a lava (I don't know how lava flows though). If you're not sure, try piping a little dollop and see if it leaves a peak that will not spread or if it spreads too fast. You should still see a little peak after you pipe, but the peak should disappear or almost disappear after you pipe a row of them. Put the batter in a piping bag with round tip (I used a tip with approximately 9mm in diameter) and pipe the macaron batter on top of silpat or parchment paper-lined baking sheet. Bake at 325F for about 14-15 minutes. Once baked, slide the silpat or parchment paper onto a wire rack to cool slightly. Peel each macaron shell carefully. You can fill them with ganache or flavored buttercream. Keep it in an airtight container in the fridge and let it sit at room temperature for a few minutes to soften up before consuming. What a perfect pairing, they sound delicious! Woot! I'm sure you must be very excited :). Too bad I live too far away to get samples hehehhe. Btw, love the new blog layout ;). you should add a "followers" spot on your blog so people can follow it! Chocolate Shavings: thanks a lot! this is a work of art. you are soo gifted. looks fantastic! I am in culinary school. I cant make macaron for shhhh. How do you get them smooth on top? Ive heard of people leave them out before they bake so a skin forms on top. any suggestions? Rebecca: the key to a smooth top is to sift your almond powder/conf. sugar finely, this will take some time. macaroon-mu baguss banget...aku masi gagal melulu bikinnya...italian macaroon emang lebih gampang ya? Anh: You should make it soon! That is really beautiful macarons! Nice feet, nice flat, smooth tops, eaven edges. PERFECT! But I have to ask, what to do mean by old egg whites and new egg whites? What is old and what is new? Old has been in room temperature for a longer amount of time? sounds amazing, can you please post the recipe for the white chocolate passion fruit ganache? thanks! I love your blog at the first sight. Love the pictures and the designs of your cakes! 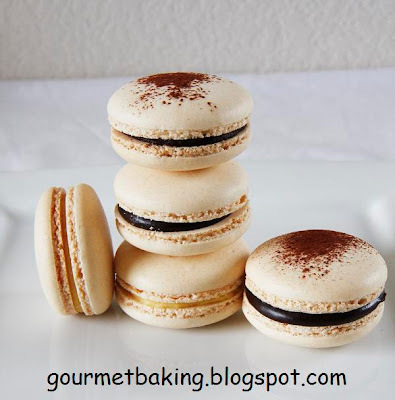 Now.. i am thinking to bake macarons which i have no experience how to get a perfect one. I even do not know how the taste!.. Hmmm..I tried exact recipe but unable to get the perfect macarons..too many air pockets that popping out. Am I missing anything here? anonymous: How did your macarons turn out flat? explode? etc? It's hard to tell what the problem is without knowing how the result is. What kind of almond powder do you use? Where do you buy it? I used Bob Miller almond meal, but I think it's not fine enough. Anonymous: I don't know what brand of almond meal I used because I buy it in large quantity and it is in a plastic container. I bought it from local bakery supply warehouse. I used to buy it from lepicerie.com also and make sure it is "fine almond powder" if you want it to be fine. Thank you for sharing!! I have been trying for months to find a recipe which works the best and gives the smoothest and most consistent results. This one does it all! Have you ever made chocolate flavoured shells with this recipe? I usually add cocoa and subtract that amount of icing. what would yoi suggest?